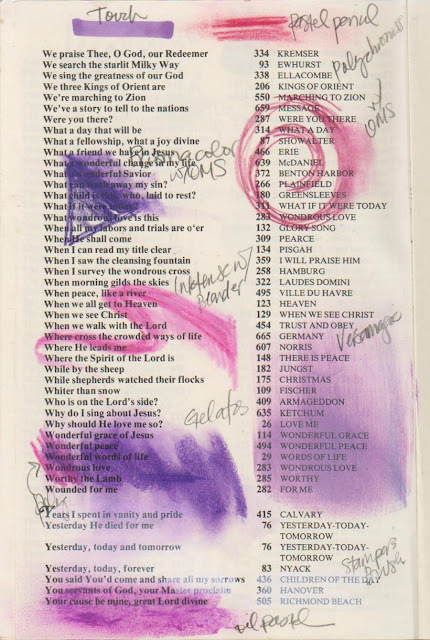 I've been wanting to start an altered book for a while, and have had the idea of using a hymnal... the words of hymns are so meaningful to me, and I love the idea of adding artwork in and around them. I don't have duplicate hymnals here, and I didn't want to use "mine" and then not have one, so I tucked that idea away. Recently, friends were moving away, and they mentioned they might have some hymnals to share... I was so excited to find that the ones they had were the same as mine, so I can have one to read, and one to create in. YAY! I did a similar test page for inks, and found that Versafine and Versamagic performed the best as far as not bleeding through. Brilliance was next, then Adirondack (but possibly because my pad is a little dry); Memento bled a little and the Colorbox Fluid chalk bled a lot. I merged the test page with the back side of the page, so you can see (in a mirror image) how each ink looks from the back. And here's my first page - I didn't have any particular reason for choosing this page, just thought it looked like a fun one for full-page color. I used Gelatos for the background, acrylic paint (with my fingers) for the clouds, and Memento ink for the stamping. The stamps are from Alextamping, and they were getting pretty dusty! Great idea and it turned out beautifully! Just beautiful! 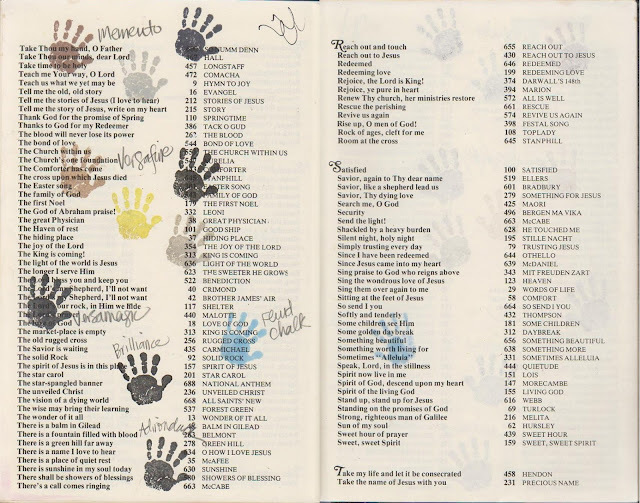 I would never have thought to use a hymnbook. Thank you so much for sharing your ideas. Wow!!! Gorgeous!!!! Truly stunning project! 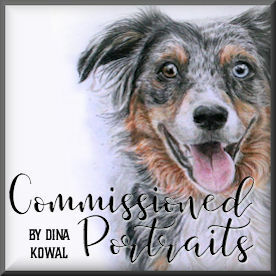 Awesome, Dina! I love the idea of the artwork as a background to the hymns. Wouldn't that be a great gift for a minister or music teacher??? I can't wait to see more! 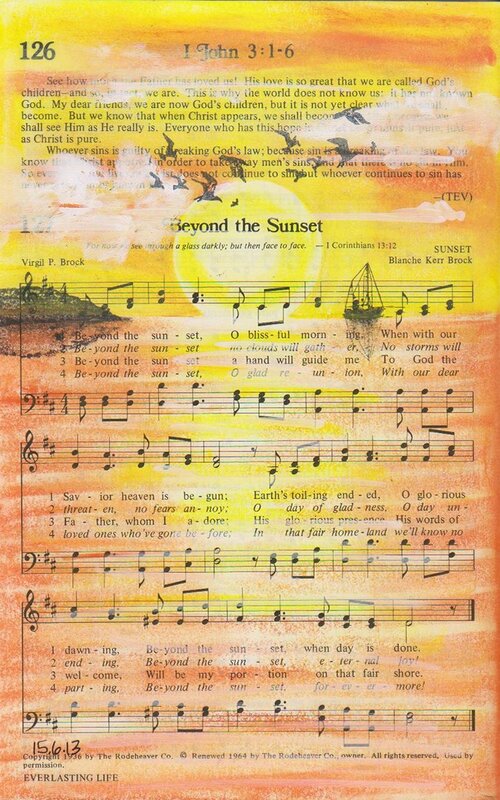 Your interpretation of Beyond the Sunset for the first page of your altered hymnal is incredible. I can't wait to see future projects. Oh Dina, what a wonderful idea! I have wanted to start art journaling for the longest time. 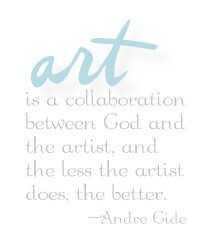 Since I love to write pieces with my cards it seems the next step in my art journey. What an inspiration you are to everyone. Wow, what a great idea, and the one you chose was so perfect for the art and colors! Fantastic job! TFS! Beautiful idea!!! 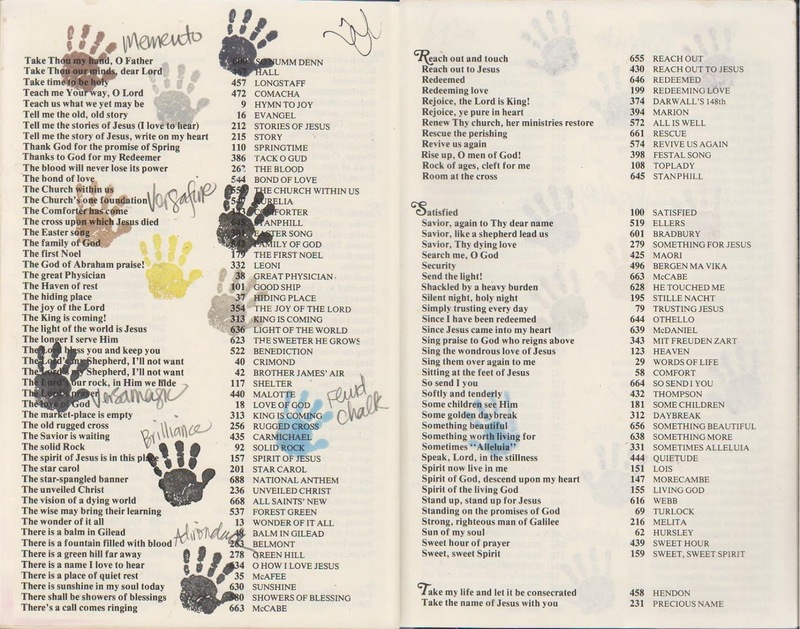 Thanks for sharing your discoveries of what worked and what didn't for your hymnal. Look fwd to seeing more of your gorgeous pages. I bet some Christmas carols would be lovely.